The Lust Lizard of Melancholy Cove, Christopher Moore, Avon/Spike, 1999, ISBN 0-380-97506-8, $23.00, 304pp. Pine Cove is a sleepy California coastal community in that brief and idyllic time between the tourist summer and the blustery winter. Most of its residents are refugees from the stresses of Los Angeles, accustomed to relying on therapy and medication (a combination of valium and Prozac) for their well-being. The local constable, Theophilus Crowe, lives in a state of never-ending self-prescribed euphoria through the use of Sneaky Pete, his smokeless bong. A beautiful picture, but not one that could last for longer than a few seconds in the hands of Christopher Moore. An upstream nuclear plant develops a teeny, tiny leak; the owner of the Head of the Slug Saloon, Mavis Sand, advertises for a blues singer to increase her weekday profits; and a local homemaker hangs herself, thus prompting the town psychiatrist, Val Riordan, to reevaluate her prescription policy and immediately switch everyone to placebos without their knowledge. These initial shocks become a full-fledged earthquake that rocks the community to its core, changing everything. All of this might add up to a tragedy, except Christopher Moore knows that tragedy is only two hop-skips and a jump over to comedy. Moore’s career seems to be based on taking revisionistic looks at all the major horror tropes. 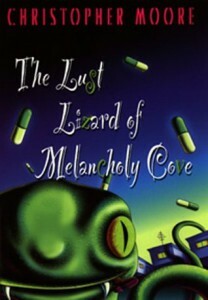 The Lust Lizard of Melancholy Cove is his fifth novel, following on the horror-laced humor of his previous books about demons (Practical Demonkeeping), werewolves (Coyote Blue), vampires (Bloodsucking Fiends), and amazons (Island of the Sequined Love Nun). [NOTE: Okay, okay, everyone sing that old Sesame Street refrain along with me-“One of these things is not like the others.” No, I am not sure where amazons fit in either. It’s the exception in my theory that proves the rule. On the other hand, many men before Moore have found strong women scary.] In The Lust Lizard of Melancholy Cove, he samples a bit of Godzilla, populating the world with characters from One Flew Over the Cuckoo Nest and the Betty Ford Clinic, and leavens it with a mystery plot that is a poor lovechild of Donald Westlake (Trust Me On This) and Elmore Leonard (Get Shorty). It is an extremely incongruous mixture, which is the entire point. because Moore plays everything for laughs. It doesn’t matter if the problem of the nuclear leak is resolved halfway through the book in one line-it served its purpose in providing the bait for the titular character, the Sea Beast, an amorous leviathan. It’s not important that the plot doesn’t entirely make sense. In a fantasy world of ex-B-grade movie actresses, half-machine/half-woman barkeeps, and rat-catching biologists, the strange and non-sequitor becomes the norm, so that even a little homage to the master of the Cthulhu mythos as a gaunt man with a drinking problem seems appropriate. As a humorist, Moore has more in common with P.J. O’Rourke and Dave Barry than the Marx brothers and P.G. Wodehouse. Much of Moore’s comedy is social satire, taking aim at corrupt politicians, materialistic doctors, new age religion (including a wonderful dig at science fiction’s novelist-turned-prophet, L. Ron Hubbard), and tourist towns. Most of the time his satire is unique and biting, but sometimes Moore gets lazy, relying on the path-more-trodden, as seen here in another picture of the computer nerd as the fat spider in the middle of a vast computer network who survives by munching on the tops of Hostess cupcakes. Humor is not an easy business, though, and Moore succeeds more often than he fails, evoking guffaws at the point of a phrase and nods to a succession of sentences. Among recent American humor novelists, only Mark Leyner rivals his ability to mix the fantastic with farce. To truly find his contemporary competition, one must look to current British humorists like Tom Holt or Terry Pratchett, who have built careers on the juxtaposition of genre fantasy and modern humor. Neither of these authors has received as much attention in America, and I suspect that Moore is similarly lesser known in Britain. In this type of comedy– a broad exaggeration of culture and mores–it helps to intimately understand the specific stereotypes that are being teased. Terry Pratchett has become England’s best-selling author (and a publishing institution) by achieving a consistent quality in his prose and releasing a new book every year. Like Pratchett, Christopher Moore seems to have settled into that comfortable pace. Considering that he has several more famous monsters of filmland yet to roast, he should be back again next year with another tale of hideous hilarity. If his future output can match the quality of The Lust Lizard of Melancholy Cove and his previous novels, he may become an American comedy fixture.